He teaches us that the known landscapes never end when they have been internalized and taken inside as true samples of creative identity. The atmosphere is of great importance within the work of Lluís Roura, but within it is the precision of the lines. Born in Sant Miquel de Campmajor, Girona, 1943, he considers himself a self-taught painter, although he did two courses at the Llotja de Barcelona. 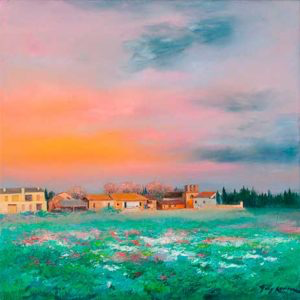 He received the advice of Felix Revello de Toro and Frederic Marés, not forgetting those who had initiated him in painting: his brother-in-law Ramón Turon, the painter Joan de Palau, the doctor Miquel Verdaguer and the rector of the town Mn. Joan Prat, who taught art history after Sunday Mass. In 1963 he moved to Barcelona where he met many painters, among them Paco Toro, from Andalusia, and participated in exhibitions and competitions, winning the most important prize when he won the Medal of Honor of the Painting of the Countess of Barcelona Prize, which he presented to the Queen of Sofia. in 1981 in Madrid. His first exhibition was in Vic in 1970, and then there were many parts of Spain and abroad: Caraques, Basel, Geneva, El Portús, Cabestany, Brussels, Miami, Saint Petersburg … he has illustrated many books: The Peoples of Empordà of Montserrat Vayreda, Lluís Roura of Lluís Racionero, Camprodon, a valley of the Pyrenees of Baltasar Porcel and Mn. 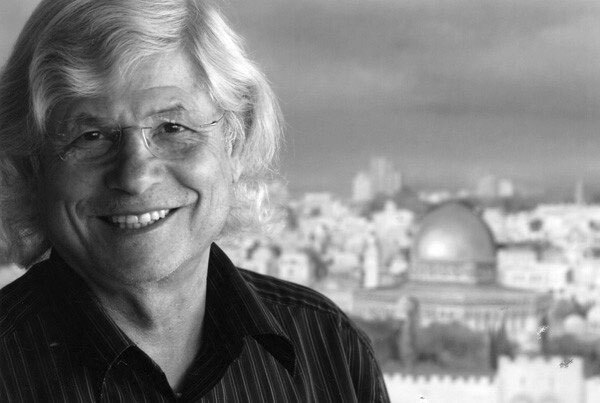 Julián Pascual … and the Holy Land. In the year 2000 he made up to five trips to Israel, and six large paintings exhibited in the parish church of Santa María de Banyoles are also fruit. And more recently, in October 2011, the work “The Landscape of the Baptism of Jesus” was inaugurated in Figueres, a large-format work of 3 x 5 meters exhibited permanently in the baptistery of the church of San Pedro de Figueres in an order of the City council. The pictorial look of Lluís Roura, more and more intense in the concepts and with wise nuances in the color, leads us to understand the amplitude of Nature by itself and also according to the intelligence of the man who knows how to understand in its immensity . From the direct observation of the beauty of the details when the poppies bloom and the barley ripens – I write in particular of his beloved lands of Girona and still, mésconcretament, of the High Empordà – he has passed, in a natural way, without any hurry because he is satisfied with everything he does, the interpretation of the great mysteries of the life felt throughout the lands of Israel – which God gave to the chosen people to be fruitful – and the growth of a total religious feeling through the interpretation of Jesus and what the New Testament represents. I have not wanted to ignore this important point in which the painter is now, since he himself is the one that best highlights his constant growth in our plastic. But this exhibition, which now offers us in the Sala Rusiñol of Sant Cugat del Vallès, although it is with current and recent work, is closer to the Lluís Roura that we know and admire for years. Because it is an artist who, demanding with his own evolution, has left aside the jumps from a very young age and now, when he was seventy years old and has more than forty exhibiting and always deserving, along with other notable awards, the grand prize of the constant assistance of art lovers, it teaches us that the known landscapes never end when they have been internalized and taken inside as true samples of creative identity. 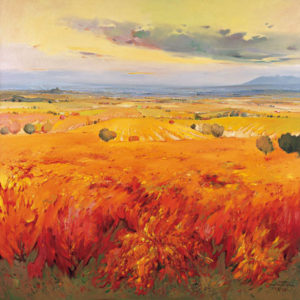 I think that these paintings by Lluís Roura, in which the lands of the Empordà are opened to infinity in the manner of the spirit that loves everything that surrounds people because it is an example of the immensity of Creation, there is a vigorous evolution towards absolute truth to paint as a manifestation of collective truth. In this case, art is much more than a representation of what has been seen and what is, to become the manifestation of what we feel in our interiors when we contemplate what surrounds us and that, beautiful as it is when presented in plentitude, is the true fruit of the tree of Truth and Life that will one day be given to us by our sincere effort to achieve it. The atmosphere is of great importance within the work of Lluís Roura, but within it is the precision of the lines, because, as always happens in a good art, he knows that the idea comes out of the soul and that it is more present to us when it is specified.